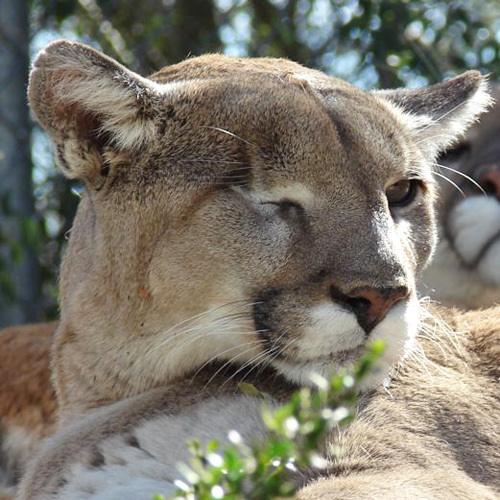 Born in 2000, Cascabel is our only one-eyed mountain lion. Her mother was killed by a poacher and she was taken to live in a tiny cage in someone’s backyard. As happens again and again when people take in a wild animal, they don’t understand the unique nutritional requirements of that animal. A nutritionally adequate diet for a large carnivore would include whole prey, with fur, bones, muscle and organ meat. As a result of the poor diet Cascabel had when she was young, she was in very poor health when she was brought to Southwest Wildlife. Our experience with these unique animals helped bring Cascabel back to health, although she remains small in size. Cascabel had one more health challenge to overcome. Her right eye was punctured by a branch or thorn in her enclosure. It became infected and the eye had to be removed, however, she does very well with her limited vision. Today, Cascabel is our oldest mountain lion. As with many aging cats, she's a bit arthritic and can be seen limping at times. She's receiving excellent medical care for her old bones. Cascabel lives with a male, Tocho.